You may or may not have seen this advertisement from IKEA’s 2015 Catalog promotion, but if you haven’t I would suggest you click this link and take a look. The quirky commercial touches on some of the benefits of owning the printed catalog in the terms of a digital device, touting its unlimited ‘battery life’ and ‘tactile controls.’ And while it’s easy to take the commercial for what it is, a lighthearted poke at the digital revolution, the message is powerful for a reason. As a Millennial, I have grown up around the world of computers and screens my entire life and, for some things, I certainly prefer printed material over digital formats. It’s true that some students I take classes with take notes on their computers and choose to buy the e-book rather than the physical copy, but the far majority does not, contrary to what many of what my older peers perceive. In fact, according to a study published in Psychological Science by Pam A. Mueller of Princeton University and Daniel M. Oppenheimer of the University of California, Los Angeles found in this NPR article, students consistently performed better on tests when taking notes by hand compared with those who chose to take notes using their computer. I’m not here to try and spread the myth that digital media is not influencing and affecting many conventionally-printed media products, but rather that most people choose print over digital when it comes to certain forms of media. I still take my notes with a pencil and paper, and when I buy textbooks I almost always choose the physical copy, although I do sometimes cave and purchase the e-book when it it significantly cheaper. There’s a certain benefit to the more tactile experience that helps me remember, and it puts less of a strain on my eyes too. In addition, a study by TrueImpact in Canada found through EEG brain wave monitoring that physical media requires 21% less cognitive effort to process than digital media. 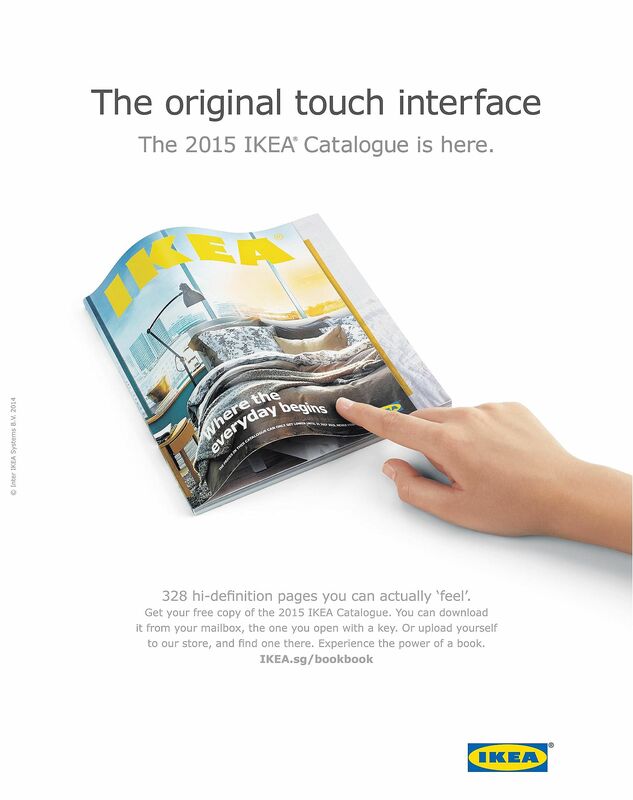 All of this goes to show that although IKEA’s campaign was meant to mock the abandonment of traditional media outlets in exchange for the sometimes less-effective digital version, the catalog’s pitch is very much relevant to the sentiments of the consumers of today. While it’s true that the convenience and sheer quantity of digital clearly excels for some outlets, people still value printed material. Print is tactile, and people tend to look at it again and again. Think of how many times you have looked at and read your favorite cereal’s box. Print is reliable and comfortable, and that’s where its value lies. You don’t have to wait for wifi to read your magazine, and there’s a greater sense of ownership of the content. So to those who proclaim the death of printing, I politely disagree. Significant changes in the industry do not represent its death, rather they necessitate a movement toward greater efficiency and creative solutions.